When introducing a new activity to kids, it can be helpful to present similar learning goals in a variety of ways. 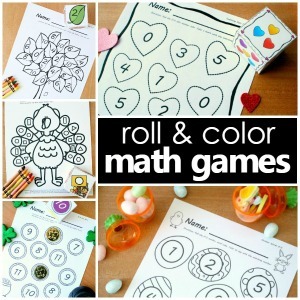 This gives kids multiple opportunities to practice a new skill. 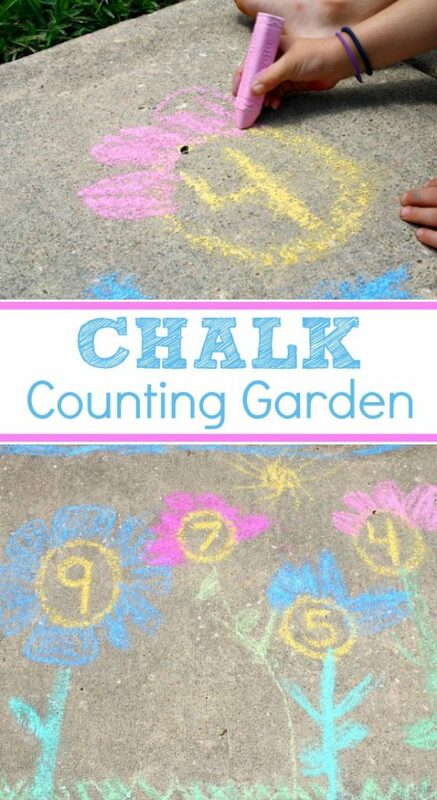 Last week we shared our play dough counting garden. 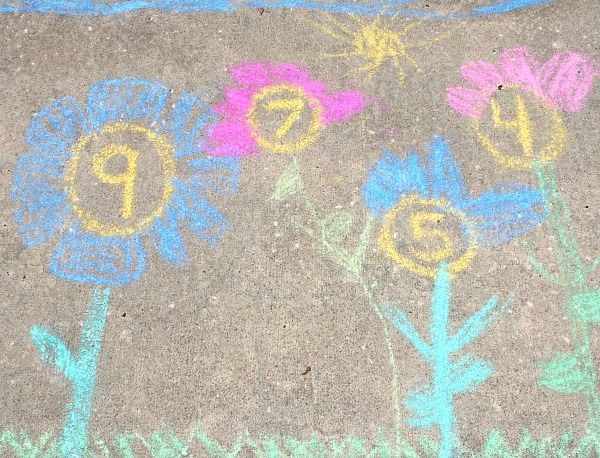 In that activity Tinker used play dough to create sets of flower petals to match a number. That activity inspired this outdoor version. Whenever we can take learning outside, it’s a hit! 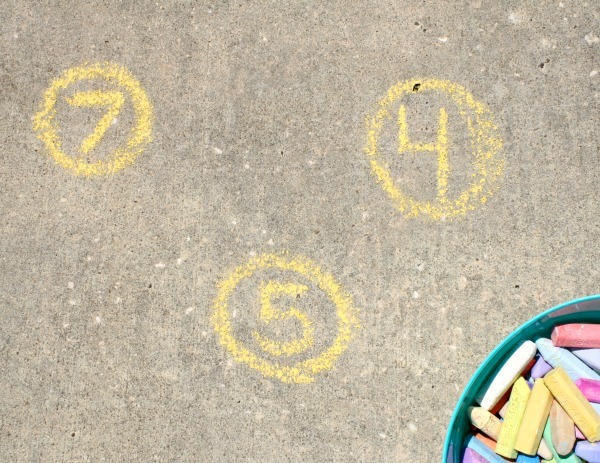 While Tinker was playing outside I grabbed our sidewalk chalk bin and drew a few circles along the sidewalk. Inside each I wrote a number. Yep, it’s that easy to set this one up! Soon Tinker came over and asked what we were going to do. 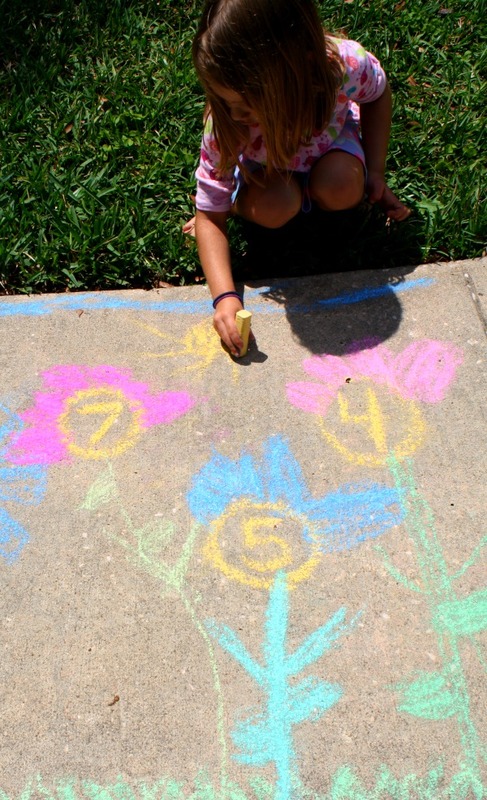 I reminded her of our play dough garden and told her I thought it would be fun to create our own outdoor garden with chalk. She got right to work adding petals to each flower. Note that kids may not have the planning ability to space their petals, and their petals may merge together and look like one large petal in the end. That’s okay. Listen as they are working and you’ll hear them counting as they go. 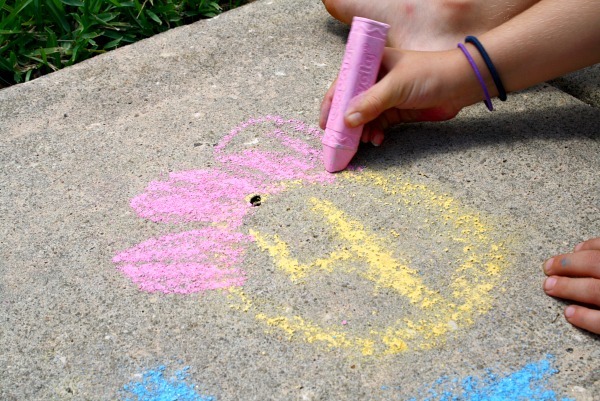 You can also model creating your own flower, and ask kids to point as they count the flower petals they drew. This will help reinforce one-to-one correspondence. After drawing the flower petals Tinker added stems and leaves to the flowers in her garden. She wanted me to work with her, so we finished the garden off with some grass, a blue sky, and a bright yellow sun. 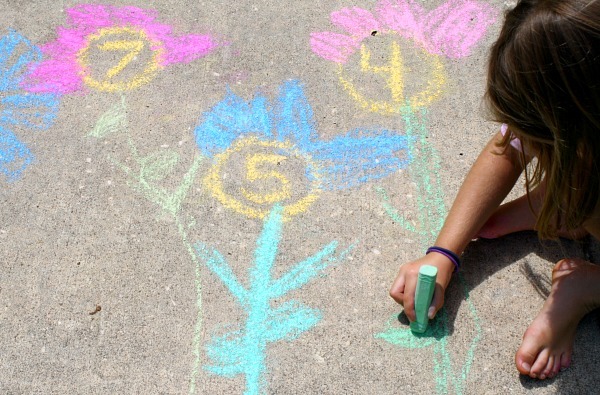 And when we were done we had a colorful counting garden to greet the neighbors as they walk by. 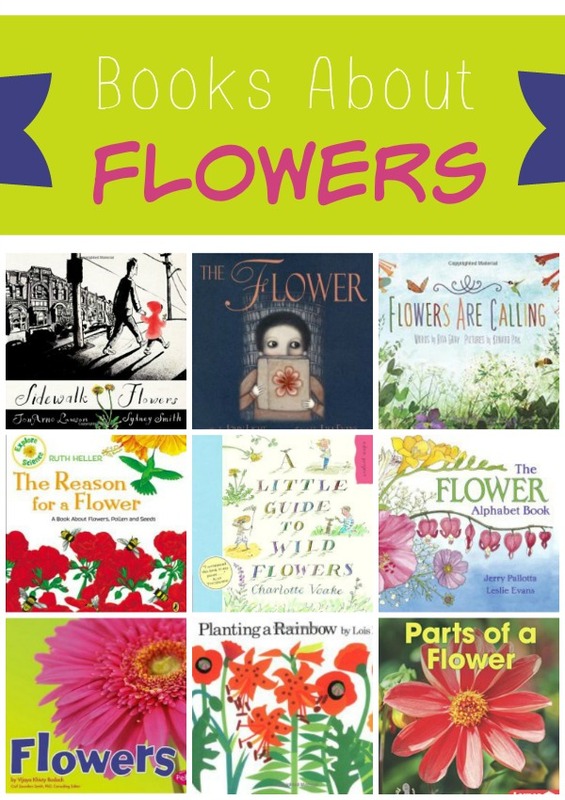 Remember to grab some books about flowers to read together. Visit our flower theme section for more hands-on learning with flowers. 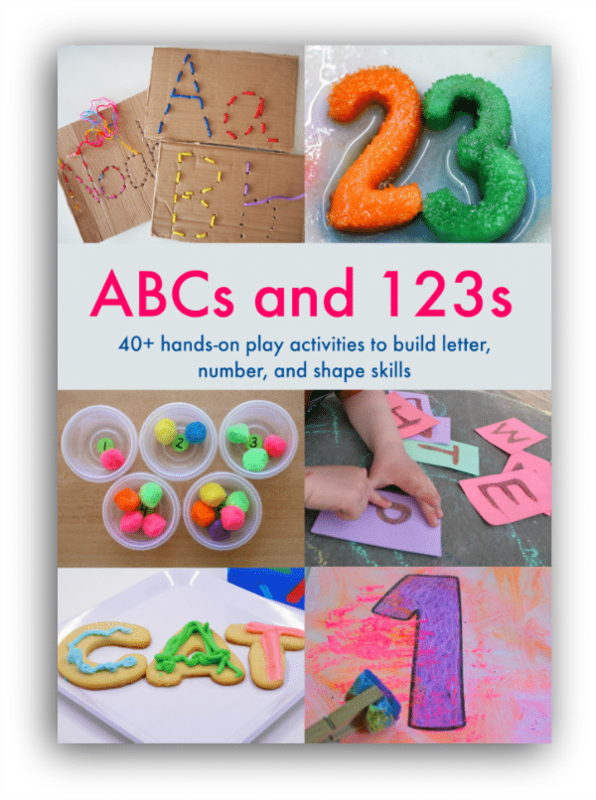 If you’re looking for more hands-on ways to practice counting and early literacy skills with kids, check out our co-authored book ABCs and 123s. 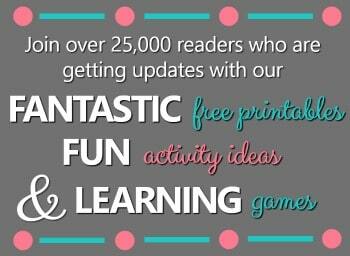 Inside you’ll find over 40 kid-tested learning activities that teach beginning literacy and math in a playful way.